Straight out of the box you can tell this boot is special. 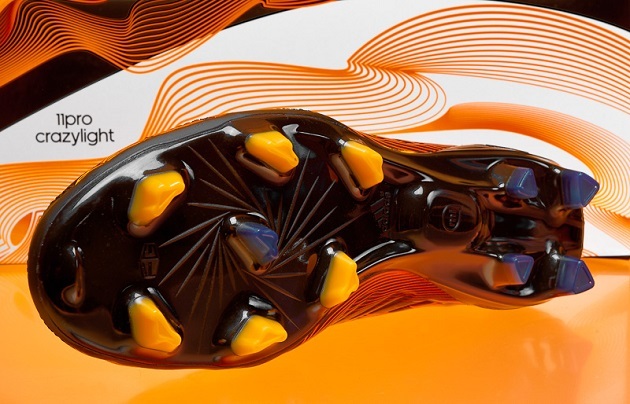 The Crazylight series was designed to give players the same feel of the standard versions of these boots, but in the lightest version possible. Adidas have accomplished that with the Crazylight 11Pro. The boot feels incredibly light in your hand and has plenty of potential to be a great boot. The colorway immediately grabs your attention when you open of the box and see these in person for the first time. Whether it’s the design or the weight, everything about this Crazylight boot is crazy. The Crazylight 11Pro features quite a unique colorway. The Kangaroo leather upper features a snake-like pattern all over the boot in a very bright orange and yellow on top of a black base. I personally believe it is a snake pattern on the upper because of the two eyes at the end of the laces and snake tongue on the edge of the toe box. The 11Pro normally features a comfort frame soleplate, but in order to make the Crazylight, well, crazy light, adidas have added the Sprintframe to the 11Pro. 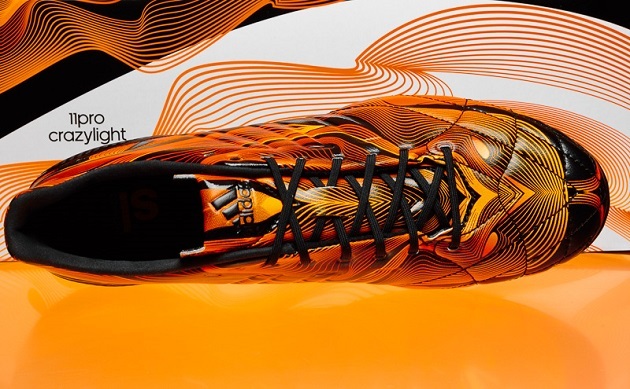 The Sprintframe is adidas’ lightest soleplate and it really makes a difference in the weight of the boot. The look of the boot is something that uis very unique and not something you will find on any other boot on the market. If you are a player that likes to stand out on the pitch, certainly give the Crazylight 11Pro a look. The 11Pro Crazylight also comes with an extra set of orange laces so if you want to stand out even more, go ahead and put those to use like Milwall’s Shaun Williams last weekend. 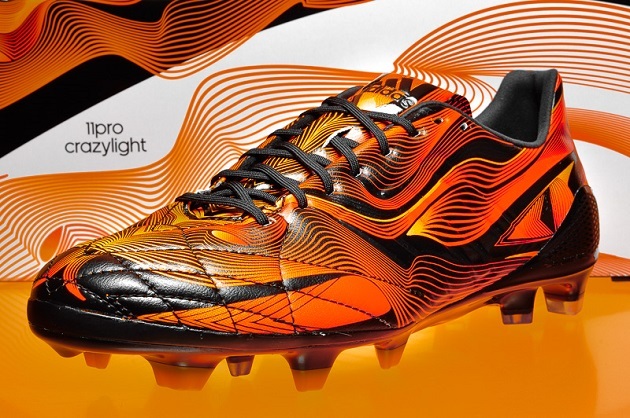 There is some debate around the soccer community that the Crazylight 11Pro is actually Hybridtouch. 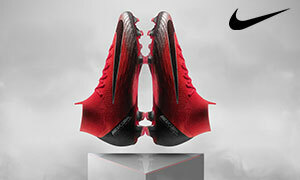 The boot is made from lightweight Kangaroo leather, so the touch on the ball is amazing. Personally, I love leather boots so the CrazyLight 11Pro is something I really have enjoyed wearing. The leather is lighter than a normal leather boot giving it a nice thin touch on the ball as well as some protection. This boot is great for a defender to use as the boot offers a great close to the ball touch while also giving a bit of room between your foot and the ball. The boot is thin yet padded so it offers a very unique feel that I love. I was able to play with the Crazylight 11Pro on a few types of playing conditions, (dry hard ground, nicely kept fields, and wet and muddy surfaces) and it performed extremely well. The boot did not absorb much water at all and kept its nice soft touch in all weather conditions. The weight is extremely noticeable when playing and really feels great on my feet. Leather boots never truly weigh me down but the weight of leather boots are the only downside to them in my opinion. The Crazylight 11Pro gives you the best of both worlds in that regard. Striking the ball with the Crazylight feels incredible. I felt very close to the ball while also having that padding in between my foot and the ball to take away some of the sting from a hard strike. I experienced no issues passing or controlling the ball as well. All together, the touch on the ball that the Crazylight gives is one that I have only ever experienced with other leather soccer shoes, but this time, the boot is also incredibly light, giving you a great feel for the ball without getting bogged down. The Crazylight 11Pro feels great. I was surprised at the level of comfort I felt even with the narrower soleplate. The Sprintframe soleplate helps shed a lot of weight off of the standard 11Pro. 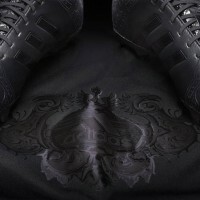 The boots come with an extra set of laces and a set of comfort insoles. I used both insoles during the testing and both felt great in the shoe. The comfort insole is the one I preferred more than the lightweight insole just to add more to the comfort level. The boot forms to your foot after a few session and it feels great once it completely molds to your foot. The boot features some thin laces to go with the lightweight boot. The inside of the boot has memory foam in the tongue and the toe box to really give you an amazing fit for your foot. The memory foam also helps the boot have great comfort in the tongue and toe box. The midfoot is the only space on the boot that is narrow. It is not excessively narrow but something to note when choosing the right size. The toe box and heel are not narrow or wide and my foot fit perfectly fine in them. I had no trouble with traction in the 11Pro in any condition I tested in, including muddy and rainy conditions. Adidas have put a $250 dollar price tag on the Crazylight 11Pro, which I must say, is hard to justify. The boot itself is an amazing one that caught me by surprise on foot. $250 dollars is a lot for any pair of cleats. 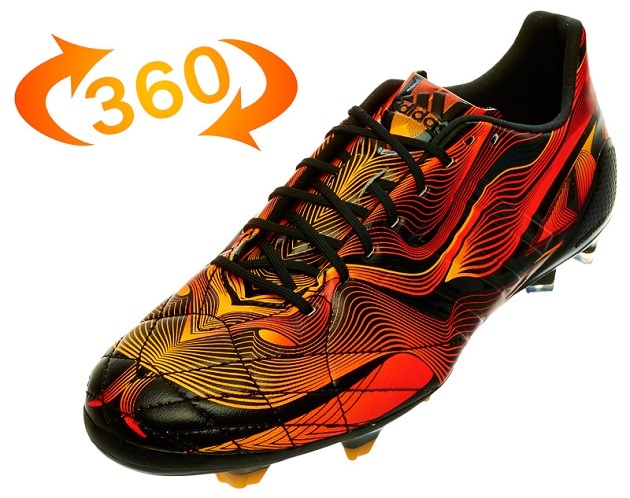 Over at SoccerPro.com, you can pick up these flashy boots for cheaper than the retail price though. 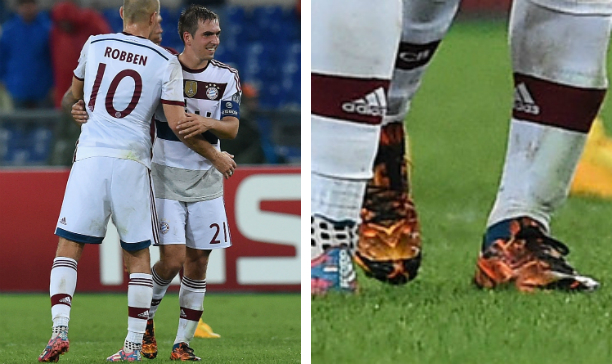 Our weekly boot spotter Jordon spotted Phillip Lahm wearing the Crazylight 11Pro in a league game for Bayern Munich. 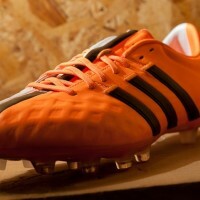 Lahm is the face of the 11Pro and appears to be a fan of the new lightweight version of the leather cleat from Adidas. Millwall’s Shaun Williams stepped out this weekend with the Crazylight 11Pro, choosing to go with the bright yellow laces over the black ones. The Crazylight version of the 11Pro seems to gaining popularity even with professional players. The Crazylight 11Pro is a surprisingly nice boot. I have had no discomfort on the boot and no visible wear and tear has occurred. 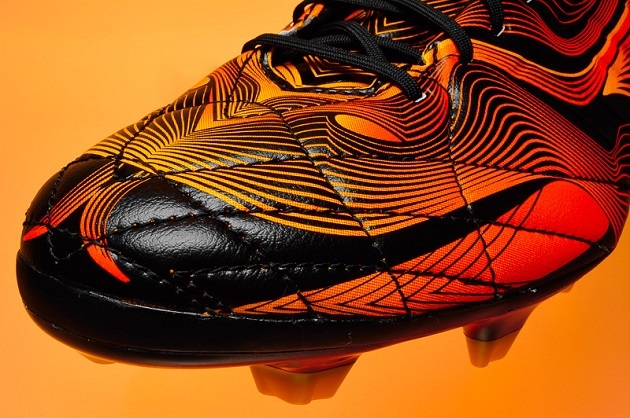 The only downside I would say to the boot is the design. Although it is a unique deisgn, you either love it or hate it. I don’t hate it but I think it could be a bit better for such an expensive boot. The leather really formed to my foot and made the comfort level even greater throughout my testing. The $250 retail price will scare a lot of people off of the new Crazylight pack but with discounts and sales, the Crazylight pack is something to give a shot with. The new 11Pro has made its way into one of my favorite new boots on the market at the moment and one I will be wearing a lot more often. The Crazylight 11Pro is a very underrated boot and one that I personally love wearing. I purchased these boots at a super cheap price of $158 Oz dollars on the Adidas website when they had a sale not long ago. After wearing the original adidas 11 pro back in the KAKA days I reverted back after many years with Nike. Best decision I have ever made. I am a box to box midfield player with what I have been told “incredible pace” so this boot works for me. Play at a semi pro level in oz and training 3 times a week, so far no problems not like the Nike Magistas I purchased which are now in the bin after 2 months.